Contents: Braun Series 7 premium shaver, 4-action Clean&Charge station, alcohol-based cleaning cartridge, travel case, cleaning brush, smart plug for automatic 100-240 voltage adjustment. 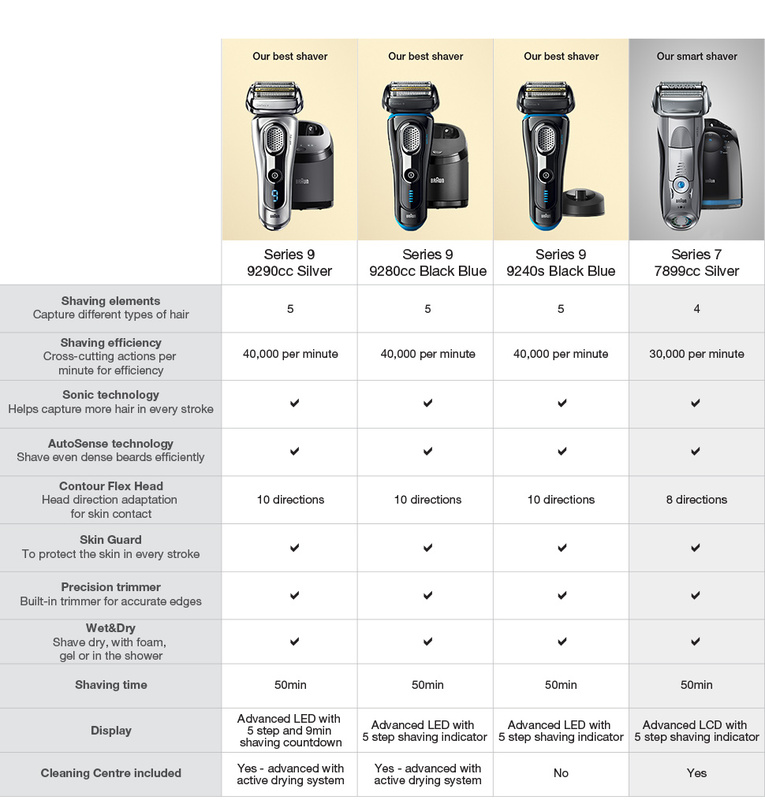 Series 7 Wet/Dry Electric Shaver Silver plus Clean&Charge Station & Travel Case is rated 4.5 out of 5 by 35. Rated 5 out of 5 by PK56 from Best I've ever had I bought the shaver a month ago and I'm really impressed, the shape of the shaver head is great for doing around side leavers and under the chin and nose. It's a little slower to use on the neck than my previous shaver, but that shaver was messy in the areas previously mentioned; a better than good compromise. The cleaning station is simple to use and keeps the shaver and my face in tip top condition. The shaver and travel case are ideal travel companions due to the size of the product. I'm thoroughly impressed with this product as it leaves my beard and skin the smoothest I've ever known since starting to shave. Rated 1 out of 5 by Ashley from Does not perform as expected I have always used a standard 3-5 blade razor to shave everyday and a friend said he lives by his foil shaver. So I purchased this based on the mid range price with the highest ratings. I know that with a standard razor I personally have to shave with the grain as otherwise I will get ingrown hairs and my face will be very sensitive and red. The instructions with this foil clearly states that you should also shave with the grain however if I try to shave either 6 hour old, one day old or two day old stubble, the foil does not pick up the hair and leaves it very patchy. The only way I managed to get a clean shave that was close (not as close as my razor) was to shave against the grain and as you would imagine this causes some irritations. Rated 5 out of 5 by Belinda from Looks great and keeps things neat in the bathroom I bought this shaver for my 17 year old son. As a teenager he has sensitive skin and the special razors and special shaving cream (all expensive) just weren’t doing what needed to be done. Going to a private school he has to be clean shaven everyday. This shaver has made his skin soft, it’s so easy to use and he has no ‘nicks’ to be seen AND it cleans itself, so my moody teenage boy can get on with his life without having to remember to clean something! Rated 5 out of 5 by Wanderer from Good package Only had it for 2 weeks but it appears to be a little nicer than the series 5 I replaced. Handles well and gives a pretty close shave, although it does take a while, going over and over while stretching the skin. Clean and charge station working well and cleaning fluid seems to last well, still showing first level indicator light. I never find a need to lock the head, so the reports of problems in the locking mechanism shouldn't be an issue. Rated 2 out of 5 by Johnny hates shaves from Not all that impressed for a razor that cost $350. Have used it a few times and not really impressed. Been shaving every second or third day and it seems to take ages to get a close shave. Even pulls in places and hurts! Thought it would've been a lot better than this. Might return it and go back to a Phillips, they shave as close and quicker and I won't get a shaving rash. not worth the $350 price tag. Rated 5 out of 5 by AussieSteve from Really great shaver I don't have stubble, I have stainless steel wire, so the closeness of a shave is all important and this gives me the best shaves I've ever had from forty years of using different electric shavers. Quiet, good handling, no messy washing unit, easily and quickly charged and a great shave. And a good price. What more do you want?